Are your old panelboards and switchboards experienceing some of the following problems? Breakers wearing out and not holding or closing properly? Replacement breakers obsolete, expensive, and hard to locate? Not enough circuits available to feed new loads? Panels not reliable any more? Thermal damage caused by loose connections? Existing panel cannot accommodate larger breakers to feed additional load? Covers and barriers missing, leaving dangerous exposed live bus? Existing breakers lack interrupting capacity now required for your system? 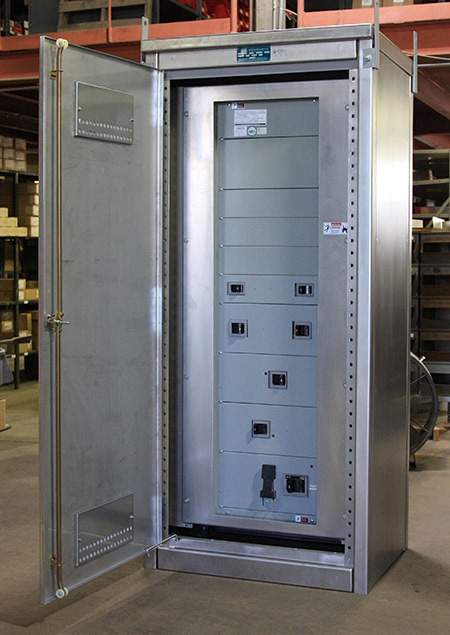 If you need to replace an outdated panelboard, regarless of original manufacturer, Penn Panel & Box Company provides state of the art panels in single phase, three phase, even two phase five wire configurations. Now you can easily change ratings, add circuits, and update your system in compliance with UL standards and NEC wire bending allowances. Penn Panel can supply new interiors and fronts to upgrade your panels without disturbing your existing back boxes and conduits. If the existing box is too small for the desired changes, we have experience designing box extensions, additions, or other solutions to meet your application. Penn Panel also can supply new door-and-trims for your existing panelboards. We can also provide replacement interiors for large power panels and switchboard sections.